RAMSJO black-brown cabinets look great when mounted up to the ceiling. 1. The height of your ceiling: Ceiling height will not only an impact on whether you will have enough room to leave a space above cabinets, but it will also impact the size of the AKURUM cabinets you can use. 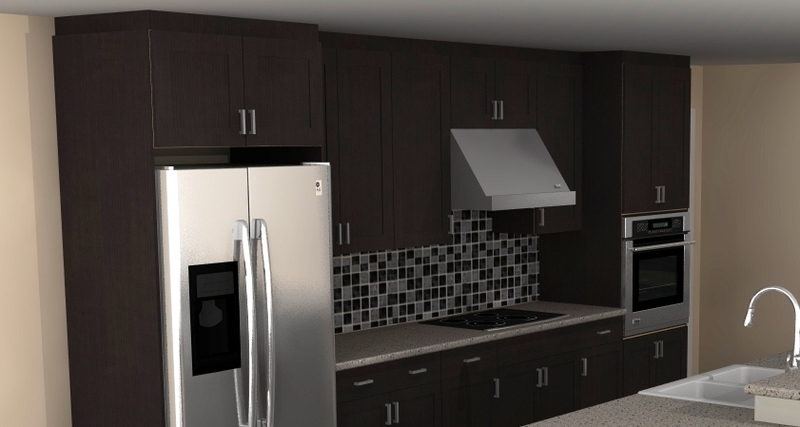 With 30″ wall cabinets, if you use the industry standard of 19 1/2″ between your base and wall cabinets, you will need a minimum of 84″ in height, and with 39″ cabinets you will need a minimum of 96″. If you are planning on installing a PERFEKT plinth as a trim or leaving a space, that will have an impact on the size of the cabinets that you can use and whether you can install them right to the ceiling or not. PERFEKT plinth pieces can be cut on site and can be up to 3″ high. 2. Contour of the ceiling In most kitchens, it is not always easy to see, but the ceiling is not perfectly level. Even in new constructions the ceiling, just like the floor, will have some variances in height (the better the builder, the more accurate they will be). While it may not be obvious when just looking at your ceiling, trying to install cabinets this way can reveal some significant high and low spots. Since your IKEA cabinets should always be level, regardless of the ceiling conditions, you will want to accurately note all of the high and low spots before deciding how you are going to install your AKURUM kitchen cabinets. This is one of the reasons that most people leave some empty space above the cabinets or use trim pieces. This can help hide all the imperfections in the ceiling. 3’x8′ PERFEKT cover panels will have to be cut on site. Each piece is 96″ long. 3. Trim As mentioned above, it may be necessary to use trim above your kitchen cabinets to help hide any variances. (You can use a PERKEKT plinth for this. However, if the gap is more than 3″ high and you want something sturdier, you’ll need to use PERFEKT 3’x8′ cover panels.) Even if your ceilings are level, it is quite common for people to use trim at the top of the cabinets to add some architectural detail to the kitchen. Depending on whether this trim has to be attached to the top of the cabinets or to the face frame, it will have an impact on what level you can install your cabinets at.